Welcome to The best available leads in the United States! We have ultra-premium accredited investor leads for sale. These records include Name/Email/Phone/Mailing Address. We have 900 BRAND NEW Big Dogs, less than 30 days old. We have 400 other Big Dogs, 60 days old. We have 920 older Big Dogs, 90 days old. These are truly the best leads in the country and have been for 3 years running. 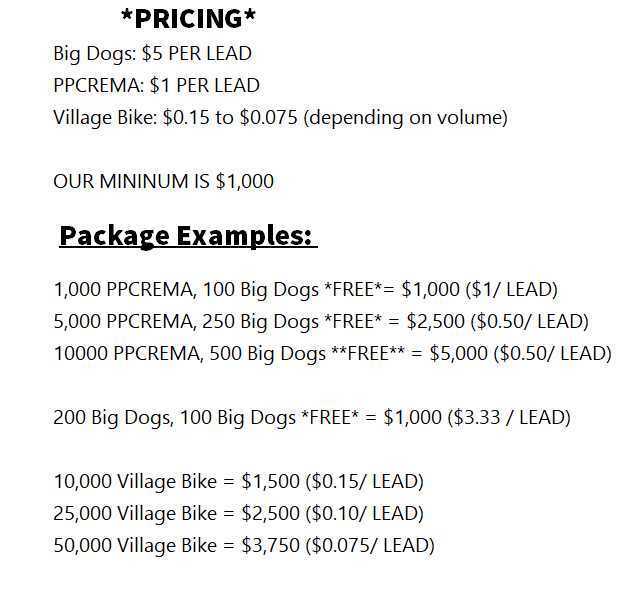 Lately we’ve received many reports of brokers selling fake Big Dogs. Watch out for fakes out of California and Florida. We’re very excited about this file! This file is the updated version of the PPCREMA and PPCREMA Platinum that have been some of our most popular files. It shows the dates the memorandum was mailed, and includes a small client list. These are the same as our PPCREMA from our competition.. they were hammered 6 months ago but they have been out of business for 6 months. So the data has cooled off. Great for new guys and dialers. Price is right and your price per deal will be very low.